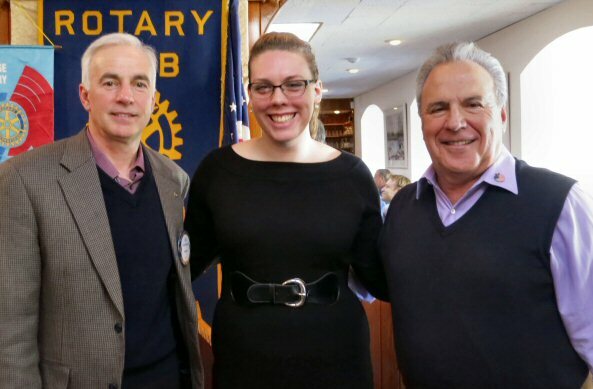 On Tuesday, November 18, 2014, the Rocky Point Rotary Club welcomed guest speaker Rebekah Bennett. Rebekah, 2008 graduate of Rocky Point High School, participated in the Rotary Summer Youth Exchange Program in 2006. Her friend and mentor that encouraged her to take this journey was Rotarian C. Clifford McLean. Rebekah shared with the club members details about her five weeks abroad in Germany and how this experience changed her life and put her on a path to her future. Rebekah followed her dream and now speaks four languages--English, French, German, and Spanish. She has traveled the world and Rebekah currently teaches ESL and lives in Seongnam, South Korea.